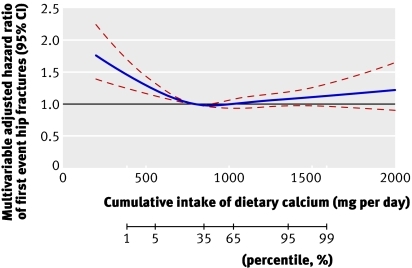 Although it is well established that a decrease in bone mass increases the risk of osteoporotic fractures, the proportion of fractures attributable to areal bone mineral density (BMD) is rather low. Here, we have identified bone mineralization defects together with low serum 25-hydroxyvitamin D (25-(OH) D) levels as additional factors associated with femoral neck fractures. Osteoporotic fractures of the femoral neck are associated with increased morbidity and mortality. Although it is well established that a decrease in bone mass increases the risk of osteoporotic fractures, the proportion of fractures attributable to areal BMD is rather low. To identify possible additional factors influencing femur neck fragility, we analyzed patients with femoral neck fracture. We performed a detailed clinical and histomorphometrical evaluation on 103 patients with femoral neck fracture including dual-energy X-ray absorptiometry, laboratory parameters, and histomorphometric and bone mineral density distribution (BMDD) analyses of undecalcified processed biopsies of the femoral head and set them in direct comparison to skeletal healthy control individuals. Patients with femoral neck fracture displayed significantly lower serum 25-(OH) D levels and increased serum parathyroid hormone (PTH) compared to controls. Histomorphometric analysis revealed not only a decreased bone volume and trabecular thickness in the biopsies of the patients, but also a significant increase of osteoid indices. BMDD analysis showed increased heterogeneity of mineralization in patients with femoral neck fracture. Moreover, patients with femoral neck fracture and serum 25-(OH) D levels below 12 μg/l displayed significantly thinner trabecular bone. Taken together, our data suggest that impaired bone mineralization accompanied by low serum 25-(OH) D levels is of major importance in the etiology of femoral neck fractures. Therefore, balancing serum 25-(OH) D levels and thereby normalizing PTH serum levels may counteract pronounced mineralization defects and might decrease the incidence of femoral neck fractures.